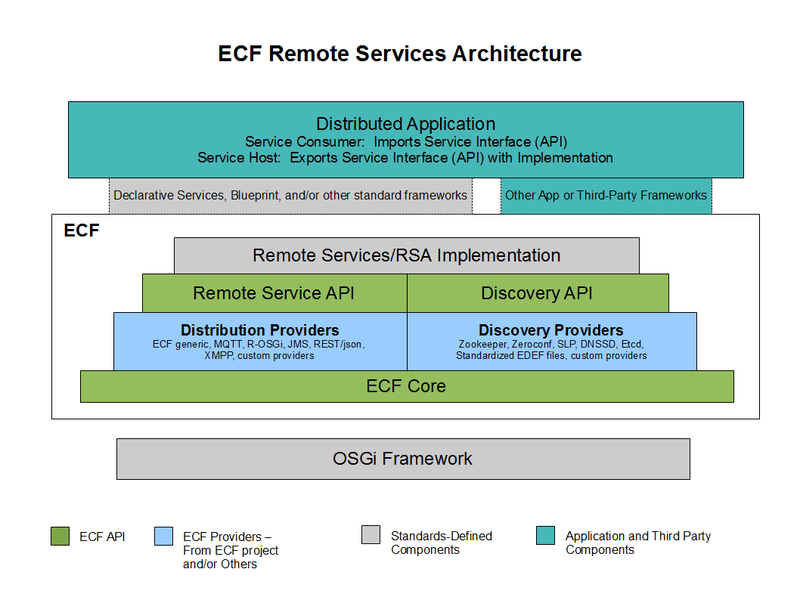 ECF's support for OSGi 4.2 Remote Services is a layered set of application programming interfaces (APIs). As discussed in blog entry "Those Leaky Networks", API layering allows service programmers and service consumers to decide which mechanisms are appropriate for any given distributed service, and to use the appropriate mechanisms, without sacrificing the ability to switch among multiple implementations of the actual wire protocol and/or serialization format (referred to as 'providers' in ECF). Here is a diagram showing the relationship between the various layered APIs in ECF's support of OSGi Remote Services. APIs are shown in white and gray, implementation/providers are shown in blue. Here are two pages (with source) showing the use of ECF's remote services to expose and access a 'hello world' remote service. This page was last modified 09:16, 22 December 2010 by Hendy Irawan. Based on work by Scott Lewis and Scott Lewis.